So, I’ve wanted a buffet for awhile now and when I came across this baby at the thrift store….it had to be mine. I got the good ol’ husband eyebrow raise, but once I mentioned that a flat screen TV would fit nicely on top (someday) it was quickly loaded into the back of our car. After a LOT of sanding, and a few coats of paint (none of which was done by me…ok maybe one coat), it now fits nicely in our living room. Except now I need a cute lamp (0r two) for the top. Filled with a few quilts nonetheless, and plenty of room for more. Thank you Jay for working so hard and for helping me finish all my silly projects! Isn't the flat screen going to cover the lovely artwork? You did a beautiful job!! Absolutely gorgeous!!! Why is it everytime I got to the thrift store, all of the furniture is that fake plastic wood? You have some good luck!! Looks great. I use an old pie safe to store my fabrics in. It is perfect because the punched tin doors give some ventilation. this is absolutely beautiful…your husband did an amazing job. it looks so pretty with the quilts inside and that picture you have hanging above is amazing. i wish i had one. Love the art work that's there! Wow! I've never seen it before. I have been looking for one too!! Yay for you that you found just what you wanted!! Hope I am as fortunate! like i'm jealous and i want one. when i went to target to get a happiness canvas, they were all sold out. I love seeing the quilts through the door. It's beautiful!! Oh wow, what a great find! It looks beautiful! It turned out great! What a find! How much was it? Looks fabulous, and I love how the quilts peek out. What a find! Oh my…I am completely smitten. That is just what I am looking for for my sewing room. nice work. That is a FANTASTIC thrift store find! I love the touch you've given, also the setting is beautiful with cherries. absolutely love it! and what a perfect spot for storing (and still seeing!) your beautiful quilts! As my children would say…that's tight! Looks great and the quilts are so cool peeking out. THAT is a gorgeous makeover :) it holds your quilts beautifully! This looks awesome! I now want to leave work and go find me some beat up furniture to buy and beautify! Oooohhhhhhh! I want one! Love it, great job!! It's gorgeous!! I NEED something similar; now I'm going to be on the lookout! Love it. What a wonderful hubby too! 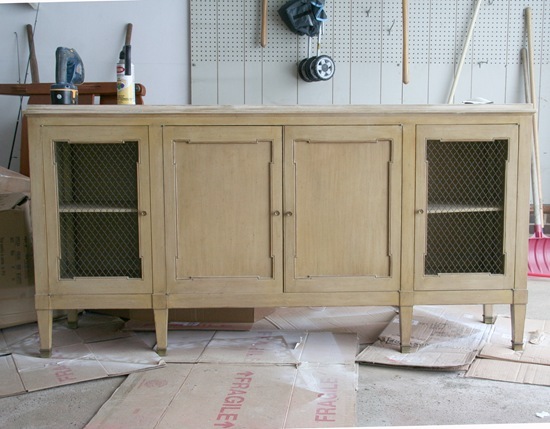 Love it, been searching for one or a older style hutch that I can refinish. Older home = no storage so I find it where I can. Thanks for the push to keep on looking. what a find! love that you can see the quilts inside. 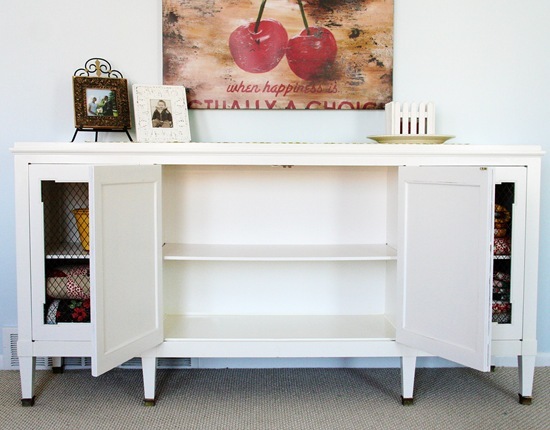 what's the best way you've found to paint furniture? i've tried a few different ways but would love to here what way you've found works the best. An amazing find. I am seriously jealous. Wow! What a great find! You and your husband did an amazing job with the painting too. Love it!! Lovely! It looks so nice. O.K. I'm totally coveting this! Would you like my information dear, so that you can put me in your will?! I think I may have to show this to the hubby and see if he can build it for me! I've been looking for something just like this to put in our front room and be able to put my quilts in! AND I have that Cherry Print! So I could totally copy cat you! ;o) Great find! Awesome refurb! wow, wow and wow! it looks absolutely amazing. i am in love with those mesh-covered cupboards. lovely! what a find. well done on the refinishing. Green Green Green with thrifting envy…I could never find this in ID. Right before you move back I am coming there and buying lots of cool stuff, and making you haul it all back. Cheers. ooooh! 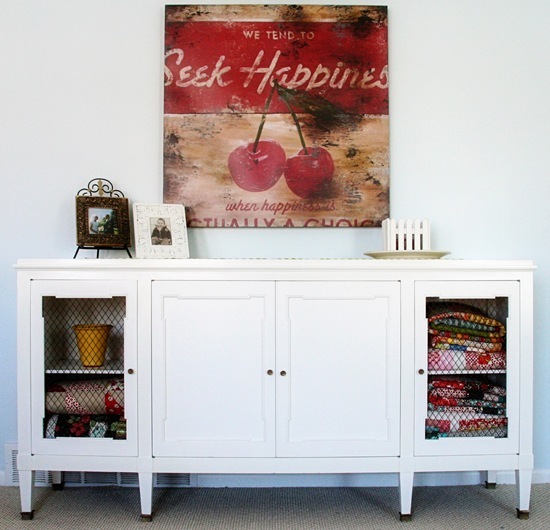 It's always so exciting when you've posted another re-furbished piece of furniture! I LOVE the buffet…enjoy! Great find and it turned out GORGEOUS! Gorgeous! I love it! Didn't you *just* have a baby? You really ARE amazing! I am so jealous! I thrift store shop frequently and I never find good stuff like that! What a wonderful find and I love how you improved it too. The quilts look great in it too but I cant imagine a flat screen tv on it, or maybe that wasnt your idea at all, lol! Great find! This is the kind of piece I would like to come across sometime. that completely rocks! lucky girl are you. Oh my gosh! What a great find! Yay for you. It turned out awesome! Love the white and the wire doors. Really nice job. You have a great eye for style. I love your blog. That is an awesome find! It looks beautiful. It's a good thing that it's late and all of the thrift stores are closed right now. Otherwise I'd be out looking for something like this! Beautiful — and the quilt storage is primo! Wow what an awesome job, now all you need to find is a flat screen at the thrift store, hahaha good luck. What a find. I work at the local humans society thrift shop and wish I could find something like that. Great work. Just thinking about it makes me want to go buy a truck…..I really need a truck! It's beautiful!!! I love what you did to it and the decor. you put up and around it. I totally agree with my mom! Make sure to get Jay his flatscreen. He deserved it. But it is just SITTING there. You have given me a new desire to finish it! What a find and I love what you did to it. Am beginning to think I need to make my furniture white too. It is gorgeous,sleek and modern. didnt you just have a baby last week? How did you have the energy & time to that big project? Wow! it looks great. !! A great find and a great way to recycle! It looks fabulous in your home, too! Cute! Cute! Cute! That is exactly what I want to put our t.v. on and store all our equipment. Love how you have it decorated too! isn't that so funny that we know just what will motivate the honey's into doing some work? oh, yea. love the empty spaces too…and can't wait to see what it gets filled with. Very cute! I like how you can see the quilts stacked. Excellent work! Now, I need to find myself one! Awesome work girl! Oh my goodness! What a great find and I love the make over. ps – Ryan is an adorable little boy! Hope you all are doing well. I'm just found your blog but I'm enjoying it! Great job! :) I LOVE your wall hanging about happiness!! Where did you get that!!?!? LOVE IT! I especially love the comment of "the raising of my husbands eyebrows" I know me and my sister recieve the same look at least daily. funnny! Gotta love them and they definatley love us. LOL! I see no tv. Yesssssss. That print is much nice to look at..